There were any number of ways in which he could have responded. He could have stated that one of the main reasons he appealed to people was that he was honest. That it would be an odd way to show respect for anyone, or anything, by turning himself into a hypocrite and tipping his hat to an institution everyone knows he opposes. He could have applied simple logic and said that respect for the victims of fascism has nothing whatsoever to do with tugging the forelock to an unaccountable, unelected Monarch. 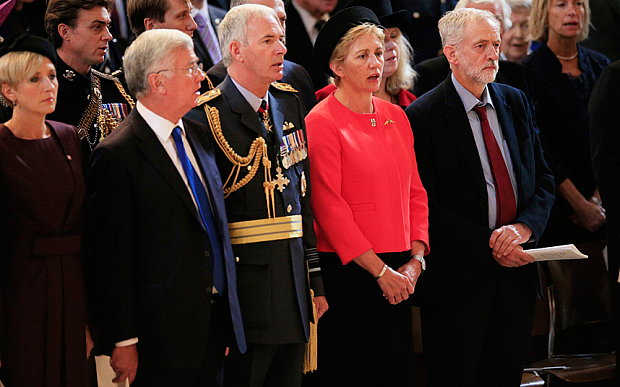 Especially one whose anthem says nothing at all about the very people to whom Corbyn was supposed to pay tribute. He might even have gone on the offensive. He could have insisted that he, a left-winger, would brook no lectures about honouring those who fell fighting fascism; especially those from an establishment with very dodgy form in this regard. The left, republicans, communists, trade unionists etc, were dying in the fight against fascism long before it was trendy. If they weren’t getting shot by Franco’s fascists, as members of the International Brigade, then they risked jail when they arrived home. Because the UK’s ruling class had agreed a non-intervention treaty with Spain and were actually quite happy with fascism in Europe – until it threatened their own imperial interests. The British monarchy, for example, was besotted with Hitler’s Nazis. As recent tabloid photographs have only confirmed. We can only hope he maintains his position and refuses to sing the imperial homage on future occasions, despite hints from “sources” and “insiders” that he will cave in and do just that. Sadly, the miserable economism and myopia, regarding the really big class questions, with which the English left is infected are intact. Some have suggested now is not the time to have this fight. That it’s a trivial issue and not as important as unemployment/housing/jobs/add your own sect’s current hobby-horse here. That it will only cost Corbyn votes from sycophantic royalists and lumpen, lager-soaked, solider-worshippers. Such people couldn’t be more wrong. This issue goes right to the heart of power in the UK; the Monarchy, House of Lords, Parliament and so on. Issues of this type address the very nature of democracy; about how we are ruled and by whom. These are fundamental questions that can’t simply be avoided by a serious politician, intent on radical change. ‘Ah yes, but now is not the time to ask those questions!’ say some. But if not now when? And if not by the most left-wing leader of the Labour party ever, then by whom? As Jeremy Corbyn stares across the despatch box at David Cameron, he knows that while his opponents are in front of him, his enemies are behind him. His only real defence against the impending treachery from within his own ranks is to build on the support of the hundreds of thousands outside parliament. Those people who supported his leadership bid because he was a republican, because they believed he was a different breed of politician. Because they believed Corbyn was a man prepared to, finally, take on the powerful vested interests that really run the UK. Capitulation now will win him no support from monarchists but could easily cost him support from others. From those who really believed he was a man who meant what he said and said what he meant. He must ignore both those in his own ranks and also an opportunist and cowardly left who tell him to back down. It’s never the wrong time to say the right thing.